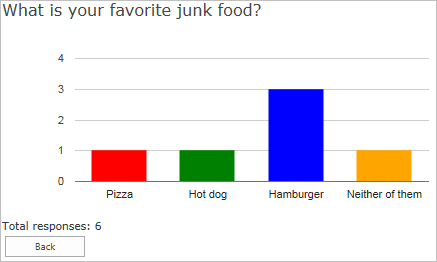 I have brushed up the 5 year old solution Poll for SharePoint, to change the deprecated “Google Image Charts to use Google Charts (AKA Google Visualization). The Image Charts are officially deprecated, but will probably continue working for some time, but to ensure you have a working solution, you should upgrade to this new version. Please note that there are some changes to the Content Editor Web Part code, so existing users must not only update the script file, but also look over the CEWP code and make some small changes. This code lets you generate polls without the need for server side installed WebParts. v2.0 released. This one has no new functionality, but the code has been brushed up, and now the charts are generated using “Google Charts” rather than “Image Charts”. Name it anything you like, but keep the display name fairly simple (no special characters) as you will use the display name in the CEWP code. The CEWP code below refers jQuery from Google. If you have a local copy of jQuery you can change the script src. You find the code for the file “SPJS-Poll.js” at the bottom of the page. NOTE: You must change the script src for the file “SPJS-Poll.js” and “spjs-utility.js” to point your instance of the files – the CEWP code will not work unless you do this. // If you want to override these texts, uncomment the object and localize as you like. listBaseUrl: The baseUrl of the site. This is like “/sites/hr” when the list is located in the site “hr” under “/sites”. Use L_Menu_BaseUrl (or omit the property) for current site. a: Answers in an array format. To use free input and not predefined answers, leave the array empty. forceLowerCaseAnswer: Primarily for use with free input to avoid getting two “series” when the only difference are uppercase characters. chart: “bar” for bar chart, “col” for column chart, “pie” for pie chart or “table” for a plain table. If you leave the attribute “a” as an empty array, the user can supply free text as “answer”. When using free input, the result are automatically presented as a table. The code for the file SPJS-Poll.js. You find spjs-utility.js here.